Price includes discreet delivery - Lower prices for Pick up orders. 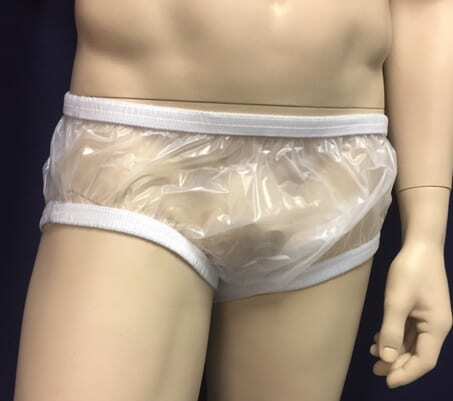 Softwear Bikini PVC pant with Enclosed elastic waist and legs fits snugly over either disposable or cloth Pads. The Bikini pants are a popular product because they contain less bulk; they fit snugly over a nappy and have a low waist which effectively hug the top of the diaper. The standard Gary pant has a lot of bulk within the pant and these Bikini products are ideal for those that prefer a close fitting product.. They have the Enclosed Elastic waist which were known until recently as Comfort Style until the manufactures changed the name. This provides a comfortable fit around the waist and leg reducing the possibility of chaffing. Price includes discreet delivery – Lower prices for Pick up orders.